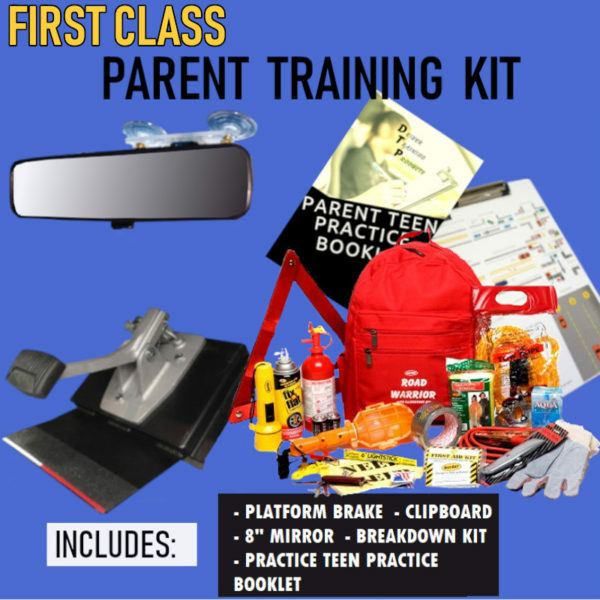 The ULTIMATE Parent Training Kit – this Bundle will allow you to train your Teen on the Road with Safety Equipment. Platform Training Brake: NO DRILLING REQUIRED on passenger side. This is the easiest brake to install in all vehicles and perfect for parents as install time is less than Bolt-In brakes and there is no damage to the passenger floor. This brake is All USA Made and designed to function just like the Drivers Side Brake. Comes with an unmatched, Unlimited Lifetime Warranty. Extend the training on scenario’s listed on our Safety Clipboard with this Training Booklet – Parallel Parking included. A must-have for any parent training their teen – dry erase clipboard printed with the top traffic scenario’s for new drivers included 2 Dry Erase Markers. Top of the line Suction Cup Mirror for increased visibility. Made with Real Glass and features day and night dimmer. AVOID THE HASSLE OF GLUE– this mirror attaches with (3) suction cups leaving no residue and allows full range of placement. This complete kit offers dozens of life saving emergency tools so your teen is prepared for any vehicle breakdown. From Fix-a-Flat to a stocked First Aid Kit, to Reflective Triangles and Jumper Cables, this kit will give you piece of mind that your teen can remain safe in event of any emergency on the road. All rights reserved • Driver Rehab Products is a subsidiary of Inventive Driver Education Associates (I.D.E.A.) Inc. Website created by: Bizness Concepts, Inc.